I just got back yesterday from an SIT excursion to Tamatave (aka Toamasina), a city on the East coast of Madagascar. It was kind of like an unofficial Spring Break, since we had very few organized visits and activities, and we stayed in bungalows right on the beach. I don’t think I could ever get tired of swimming in the ocean (at least, if there are waves in the ocean, which there were in Tamatave 🙂 ), so I had a ball. The only downside was how much conditioner I used up washing and untangling my hair! We spent our time watching the sunrise, running on the beach before breakfast, exploring the city, swimming in the ocean, playing cards in the evening… this trip was perhaps the least “Malagasy” part of my semester so far, since we didn’t have much interaction with the local people, but it was still a really nice vacation. On Sunday while in Tamatave Anna and I went to Church with Hanta, the assistant director of program. Her husband is the head pastor of one section of the Jesosy Mamonjy denomination (a Pentecostal denomination) in Madagascar, so whenever she travels she visits the local Jesosy Mamonjy church, and at least on this occasion she preached the sermon too. It was all in Malagasy, but she explained to us what she was going to preach about in French beforehand, and gave us copies of the hymnal so we could sing along, so it was nice to know what was going on. The biggest difference between this and other churches I’ve visited in Madagascar was that the pastor never prayed alone – everyone prayed out loud simultaneously, which I thought was pretty cool. Nara getting ready to throw – intense concentration! Another great part of our time in Tamatave was getting to know some of the SIT staff members and drivers better. We found out that both our drivers, Nara and Tovo, and our logistics coordinator, Rivo, are part of the same professional petanque (aka botchy ball) club, so a couple of afternoons we played petanque with them on the dirt road in front of the hotel. One might think that petanque is not the most exciting game, but actually it was really fun, especially since the guys are really funny, and obviously way superior in skill compared to us, but at the same time not in the least condescending. 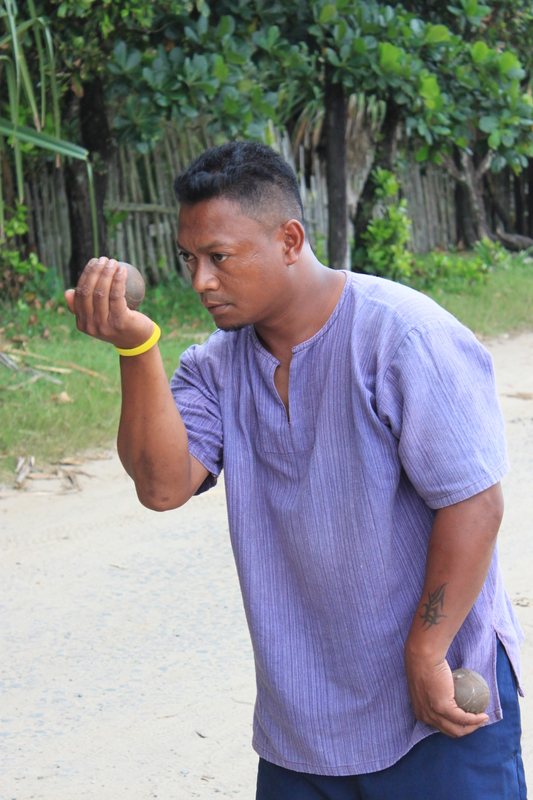 I played on a team with Rivo, and I later found out that he and his professional petanque partner were the second best petanque team in Madagascar last year (i.e. if they had won their last match instead of losing they would have gone to China to compete)! 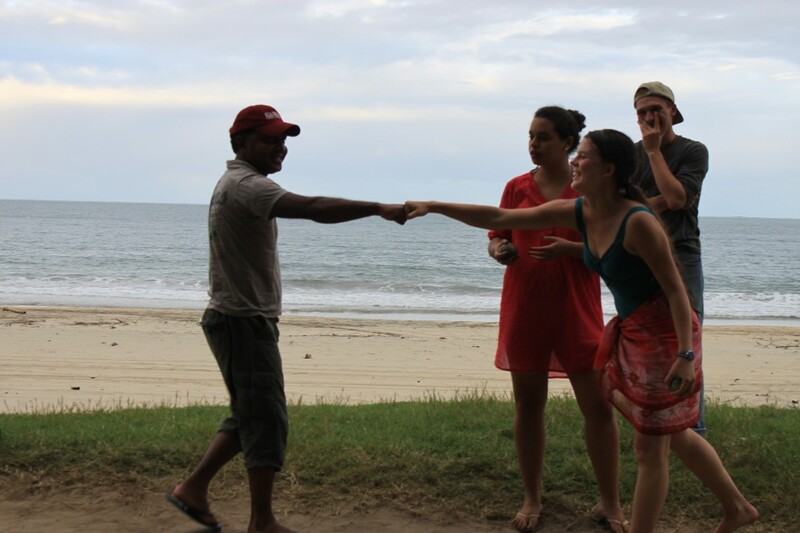 It was especially fun staying together with the other SIT students again during the excursion (most of our time in Madagascar we’ve been staying separately with different host families), as by this point in the semester we know each other pretty well. One evening after dinner we planned a series of “pranks” that we put into action on April 1st (Poison de Avril, the French version of April fool’s day – it’s meant to be a day you tell lies but we opted for doing bizarre things instead), which happened to be a day we were on the road driving back to Tana. The pranks included everyone freezing simultaneously, all 9 of us crowding into the front seat when it was time to get into the bus, pretending to be mad and not speaking during lunch, and taking all our belongings and setting off on foot “for Tana” during one of our roadside stops en route. I can’t say they were all awfully convincing, since of course collectively we weren’t able to keep a straight face, but we had a lot of fun doing it. Next Next post: Environmental Awareness and an Anecdote That Ends with Coffee.